As a people who live close to animals and nature, the Amish still do something that most Americans left behind long ago – that is, butchering and processing their own meat. This might make some us think “yuck”. But it’s the way of things when you’re on Amish farms. 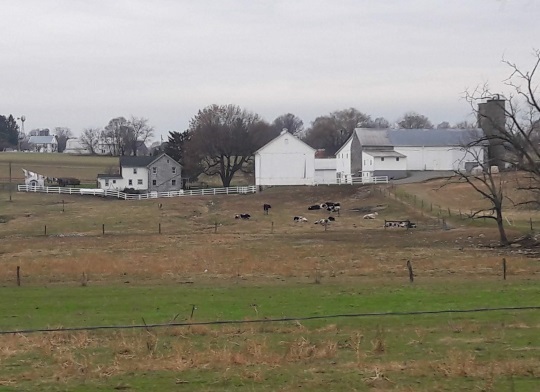 Amish have days dedicated to the task – usually in the autumn or winter when the hogs have been fattened and other farm tasks are less pressing. I remember once coming across an Amish mother during chicken butchering in northern Indiana. It wasn’t a pretty sight! But if you want those fried wings or delicious chicken broth on a cold day, this is how it happens. One of my Lancaster Amish friends has several pigs he raises each year. The sausage, bacon, scrapple and other meats feed the family for much of the year. It’s tasty. I recall my dad took a liking to the pigs one time we visited. But you can’t get sentimental about it. From what I recall he wasn’t too keen to eat the meats they shared with us. I didn’t have the same issue. But yes, pigs can be cute. Recently I stopped in at this friend’s sister’s place while butchering was happening (the same day I had my pie excursion). Everyone seemed busy with the task at hand (luckily we got there after the actual butchering part). Some men appeared to be smoking meat in the basement (I only poked my head in for a moment). His sister was working with another young lady in an out building, feeding ground meat through a simple machine which pressed it into a sausage casing. It was late afternoon on a gloomy day and they had a lot left to go. But they’ll be glad for the meat for the rest of the year. This week was an occasion as such when we had our annual hog butchering. It is a two-day deal where everyone in church chips in to do their part. Tuesday was the first day. All 19 hogs were butchered and dressed and some meat trimmed off and ground. A portion of it gets mixed with venison to make bologna or hot dogs. Packaging was my primary job, next to taking care of the children, of course. This year, most of the meat was vacuum sealed to help keep it fresh longer. Though the boys are the ones responsible for the stuffing, I am always fascinated by it. Large, home-fabricated stuffers work well to stuff hundreds of pounds of meat efficiently. After the bologna has smoked for a couple hours, it is the wheeled outdoors on a cart that’s been made for that purpose, holding up to 250 pounds. The sticks of bologna are then placed side by side on a large table and sprayed with cold water to help cool them down to where they can then be placed in vacuum bags, ready for the freezer. And for interest’s sake, yes we do have freezers, run by generators, solar power or, for folks like us, from the diesel that runs the shop equipment. A “food committee” handles meals and snacks for the hungry workers, and Gloria adds that “Never do I see stacks and stacks of dirty dishes as I do on butcher day,” not to mention all the equipment cleaning that needs to be done. Butchering is not what most of us like to think of while enjoying a burger or breakfast sausage patty, but it’s a necessary task if you want to eat meat. Do Amish appreciate the meat more, for having to convert it from live animal to something edible? I don’t know the answer to that, but maybe so. Like many others, it’s a task Amish take on together. As you can see in Gloria’s column, there is a sense of community and appreciation. She writes, “By 6:30, we were ready for devotions, shared by Nate Zehr. I was blessed by his simple way of expressing how love is the greatest, even on butchering day.” Even on butchering day. For that matter, do all Amish jump at the thought of butchering? Certainly not. One of my friends sells a lot of meats in his business. But he’s not of a farming background. And he gets little-to-no enjoyment from being involved in butchering (his meats come from suppliers). On the other hand his wife, who was raised on a farm, is more comfortable with the concept of a headless chicken. All Amish are not the same, and even – maybe especially – married couples. Glad you found the site Lou and enjoy reading on the Amish. You had an experience that 95%+ Americans will never have. It’s probably not pleasant at first but no doubt you’d get used to it, especially if it was how you put food on the table for the family. Now most of that gets handled in factory-style facilities. 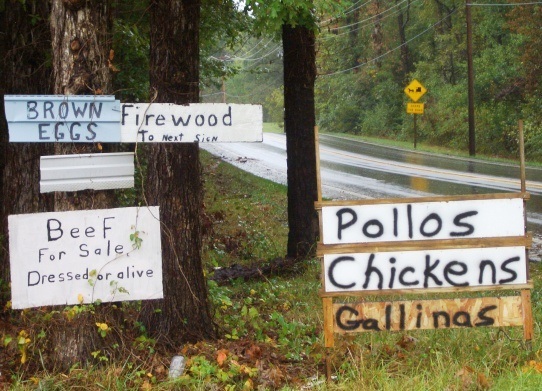 Interesting to see that the farm in St. Mary’s County, Maryland, is reaching out multiculturally–chicken offered in two different Spanish words for the almost the same thing. My Spanish is weak, but I think pollo means chicken meat and gallina means hen on the hoof, as it were. Right Boyce, I was surprised to see it myself as I’d never noticed anything like that in Amish areas, but you’d have to conclude they have a fair number of Spanish-speaking people in the community who buy from them. This wasn’t the only Amish place in the area which had Spanish-language signs. This story reminded me of a “rule” my mother made up when we were young. My grandfather had a slaughterhouse on his farm. We always had half a dozen animals at our house, mostly for 4-H Sheep Club. Sometimes my sister and I would go out to the field and discover someone missing! We would run to ask what happened to Fluffy or Puffy, etc. and be in tears. Usually we were told they were brought to my grandfather’s. This satisfied us for a while but as I grew older and realized dinner coincided with the missing animal, it was very upsetting. So the rule my mother made up- “Don’t name anything you’re going eat”! Erik–This was such a compelling article. May I have permission to re-print it in Amish Heartland, a free monthly magazine distributed to Wayne and Holmes (OH) Counties? I would like for it to appear in the April edition, and my deadline for articles is March 10. Thanks for your consideration.